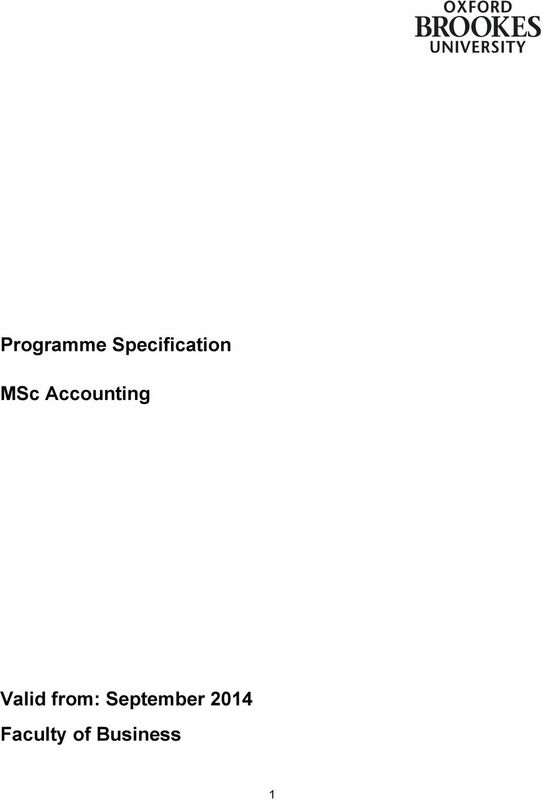 Download "Programme Specification. MSc Accounting. Valid from: September 2014 Faculty of Business"
3 colleagues, work productively in teams and make linkages between their specialist field and the wider organisational context. This is a conversion course for graduate from all disciplines. Students typically will have little or no work experience in this area and little academic background in accounting. This course is designed to give them a broad understanding of accounting techniques and how these are applied in a range of situations and contexts. This involves both a grasp of quantitative techniques but also the ability to undertake analytical and critical evaluation of key issues in accounting and to express the results in writing. Students will also develop the skills necessary to research particular issues in accounting and to apply the results of the research to specific professional problems. This programme offers an opportunity to gain relevant knowledge, skills and competencies of value for a career in the accounting profession or closely related fields. The syllabus has been designed to encompass the key disciplines that form the basis of professional education and included in the training programmes of professional bodies in the field. As such the programme will prepare students for eventual membership of a professional body whilst also equipping students with the critical, analytical and research skills appropriate for reflective practitioners. This programme aims to offer exemptions for up to 8 ACCA papers. 2.2 Aims of the programme To prepare graduates from a range of backgrounds for careers in or closely related to the accounting professions. This foundation prepares them both for further study towards a full accounting qualification and for posts in organisations. To give students a broad knowledge of accounting principles and techniques across the three accounting themes of management accounting, financial accounting and financial management. To give students the opportunity to develop work related skills such as teamwork, verbal and written communication and research skills. 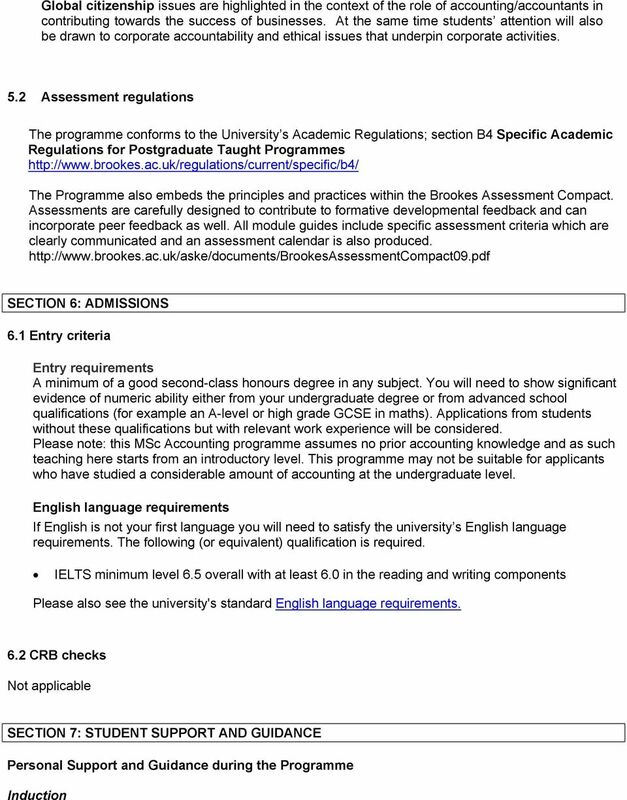 SECTION 3: PROGRAMME LEARNING OUTCOMES Knowledge, understanding and skills: Students will be able to: 3.1 Academic literacy 1. 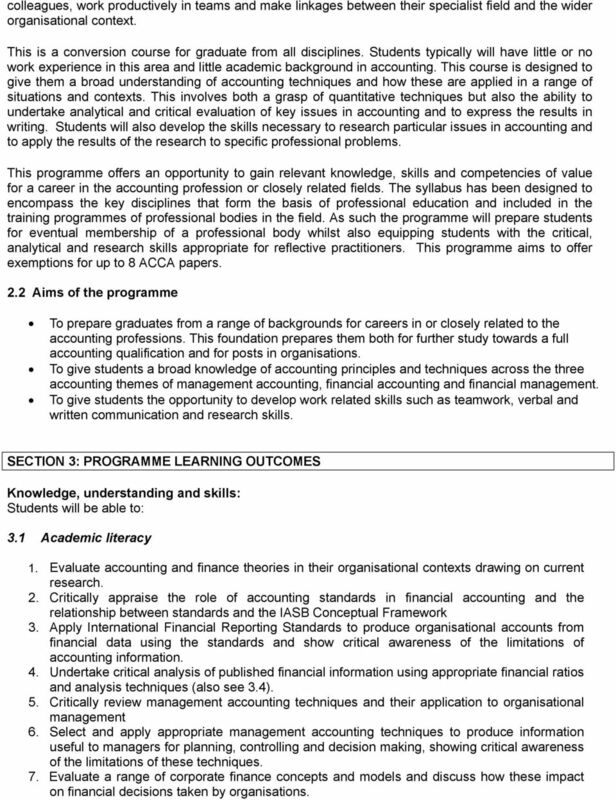 Evaluate accounting and finance theories in their organisational contexts drawing on current research. 2. Critically appraise the role of accounting standards in financial accounting and the relationship between standards and the IASB Conceptual Framework 3. Apply International Financial Reporting Standards to produce organisational accounts from financial data using the standards and show critical awareness of the limitations of accounting information. 4. Undertake critical analysis of published financial information using appropriate financial ratios and analysis techniques (also see 3.4). 5. Critically review management accounting techniques and their application to organisational management 6. Select and apply appropriate management accounting techniques to produce information useful to managers for planning, controlling and decision making, showing critical awareness of the limitations of these techniques. 7. Evaluate a range of corporate finance concepts and models and discuss how these impact on financial decisions taken by organisations. 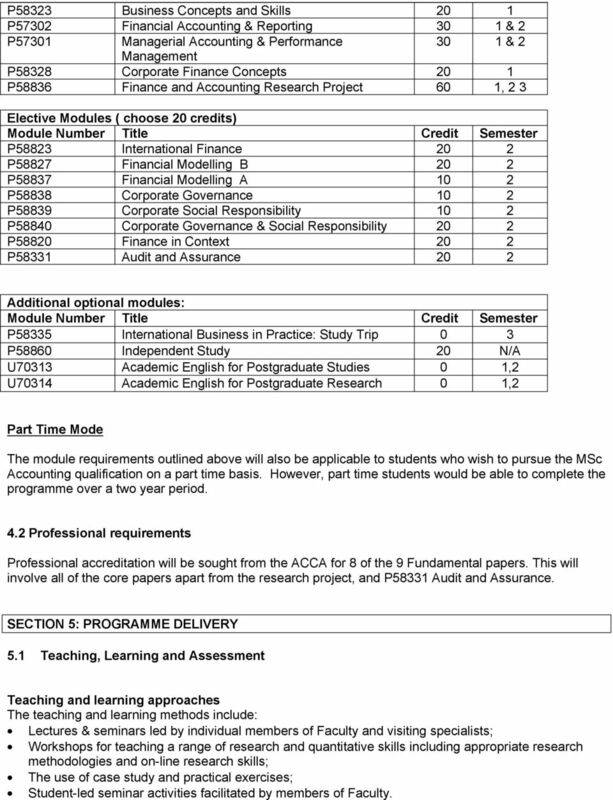 5 P58323 Business Concepts and Skills 20 1 P57302 Financial Accounting & Reporting 30 1 & 2 P57301 Managerial Accounting & Performance 30 1 & 2 Management P58328 Corporate Finance Concepts 20 1 P58836 Finance and Accounting Research Project 60 1, 2 3 Elective Modules ( choose 20 credits) Module Number Title Credit Semester P58823 International Finance 20 2 P58827 Financial Modelling B 20 2 P58837 Financial Modelling A 10 2 P58838 Corporate Governance 10 2 P58839 Corporate Social Responsibility 10 2 P58840 Corporate Governance & Social Responsibility 20 2 P58820 Finance in Context 20 2 P58331 Audit and Assurance 20 2 Additional optional modules: Module Number Title Credit Semester P58335 International Business in Practice: Study Trip 0 3 P58860 Independent Study 20 N/A U70313 Academic English for Postgraduate Studies 0 1,2 U70314 Academic English for Postgraduate Research 0 1,2 Part Time Mode The module requirements outlined above will also be applicable to students who wish to pursue the MSc Accounting qualification on a part time basis. 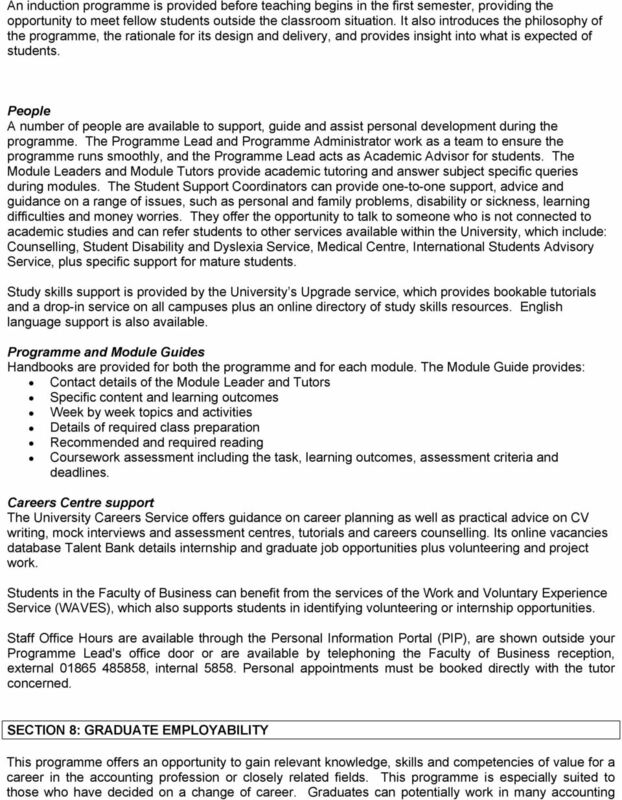 However, part time students would be able to complete the programme over a two year period. 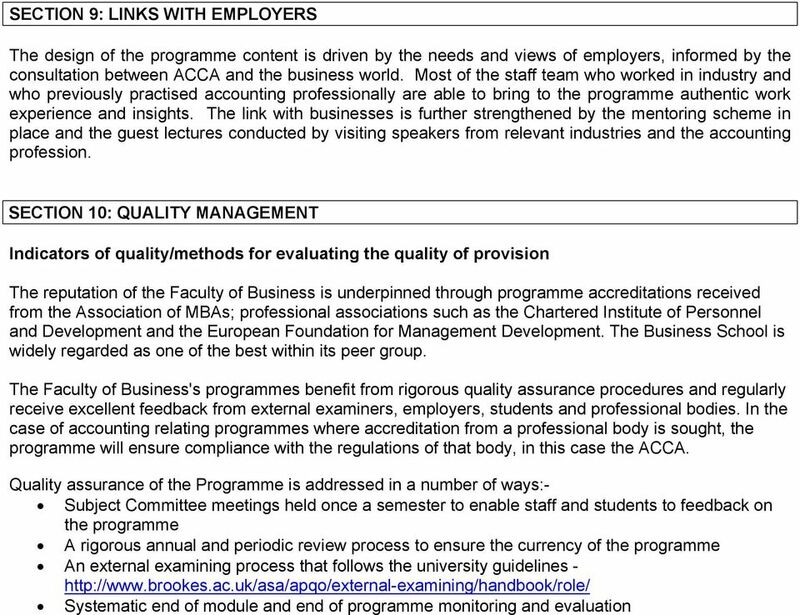 4.2 Professional requirements Professional accreditation will be sought from the ACCA for 8 of the 9 Fundamental papers. This will involve all of the core papers apart from the research project, and P58331 Audit and Assurance. SECTION 5: PROGRAMME DELIVERY 5.1 Teaching, Learning and Assessment Teaching and learning approaches The teaching and learning methods include: Lectures & seminars led by individual members of Faculty and visiting specialists; Workshops for teaching a range of research and quantitative skills including appropriate research methodologies and on line research skills; The use of case study and practical exercises; Student led seminar activities facilitated by members of Faculty. 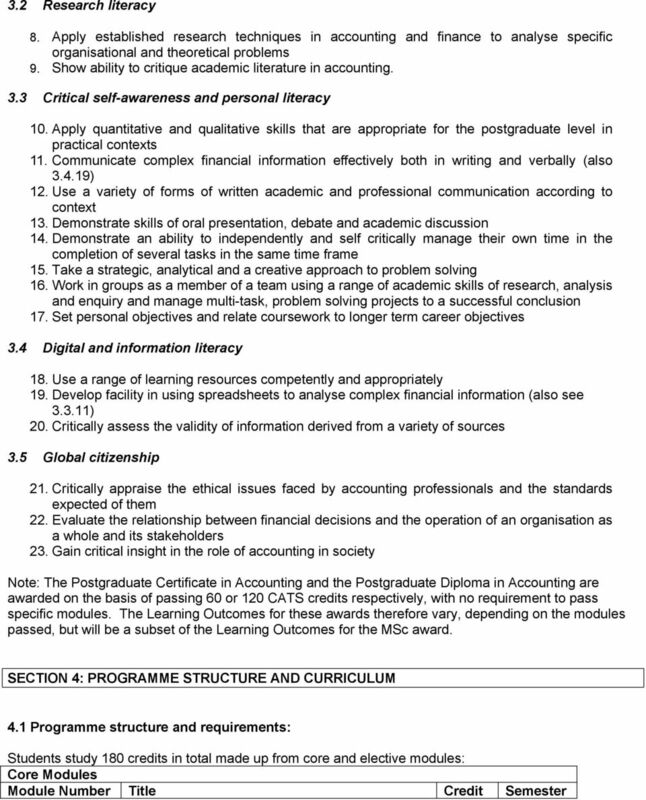 6 Support for independent research and study through workshops and tutor support Prior knowledge of the subject of Accounting is not required, but students are expected to start the programme with graduate level skills of research, analysis, critical evaluation and writing, which can then be applied to the subject of Accounting. The course will commence with a look at the skills required in accounting, namely book keeping. The modules will build on this foundation to develop knowledge and understanding in the various subject areas. Critical evaluation of fundamental and current research will also be developed through research methods workshops which will culminate in the research project. Class time and independent learning time Module Module title number Approximate class time (hours) Expected independent learning time (hours) P58836 Finance & Accounting Research Project P58323 Business Concepts and Skills P58328 Corporate Finance Concepts P57301 Managerial Accounting & Performance Management P57302 Financial Accounting & Reporting P58827 Financial Modelling B P58837 Financial Modelling A P58823 International Finance P58838 Corporate Governance P58839 Corporate Social Responsibility P58840 Corporate Governance & Social Responsibility P58820 Finance in Context P58331 Audit and Assurance Postgraduate attributes are developed in the following way: Academic literacy is the primary concern of the MSc programme, as students from different backgrounds are expected to be proficient in most areas of accounting within a relatively short period of time. The expectations are not only drawn from the teaching staff but also the requirements of the professional accounting body who offer the requisite accreditation. 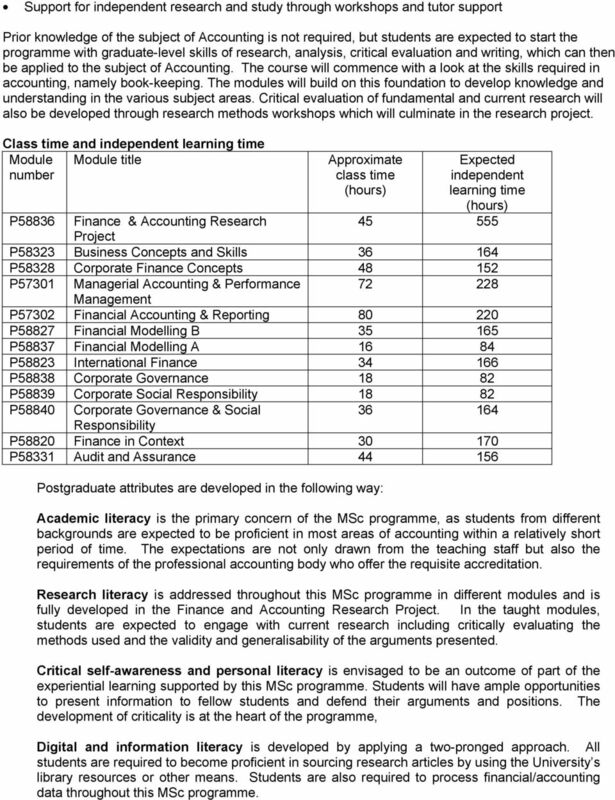 Research literacy is addressed throughout this MSc programme in different modules and is fully developed in the Finance and Accounting Research Project. In the taught modules, students are expected to engage with current research including critically evaluating the methods used and the validity and generalisability of the arguments presented. Critical self awareness and personal literacy is envisaged to be an outcome of part of the experiential learning supported by this MSc programme. Students will have ample opportunities to present information to fellow students and defend their arguments and positions. The development of criticality is at the heart of the programme, Digital and information literacy is developed by applying a two pronged approach. All students are required to become proficient in sourcing research articles by using the University s library resources or other means. 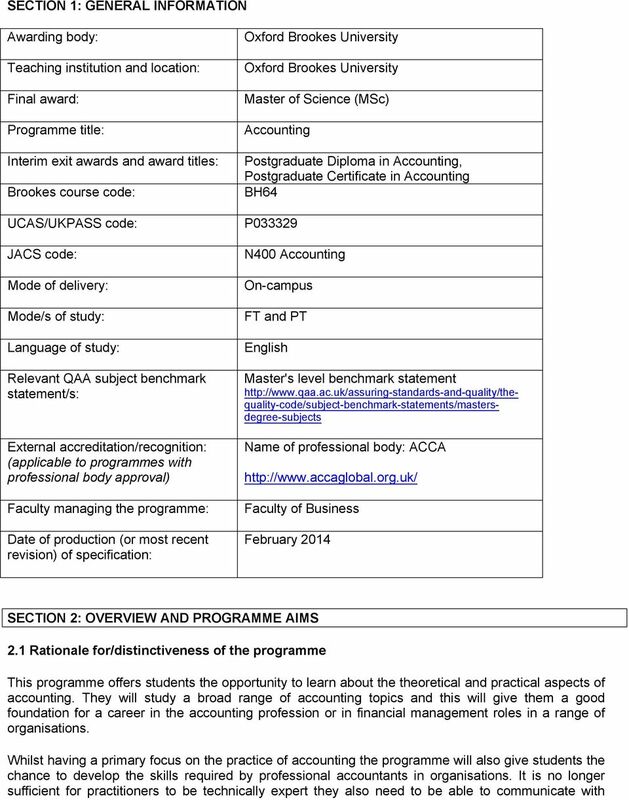 Students are also required to process financial/accounting data throughout this MSc programme. 9 related roles. For those who choose to work in part qualified roles, the MSc Accounting programme will prove to be an excellent foundation in preparing them both for further study towards a full accounting qualification and for positions in organisations.